Valentine’s Day is fast approaching and the number of incredible restaurants to dine out across the western suburbs abound. AML did our due diligence and found seven sensational menus and romantic settings that are great choices for February 14th. From a quaint BYO, to a King of Prussia steak house, to a historic 18th century barn to Wayne’s popular Paramour-and more, we have a great selection of the best the burbs have to offer. Here’s to a special evening with your sweetheart around the Main Line. Silverspoon is one of the Main Line’s most beloved BYOs. Photo courtesy of Courtney Apple Photography. 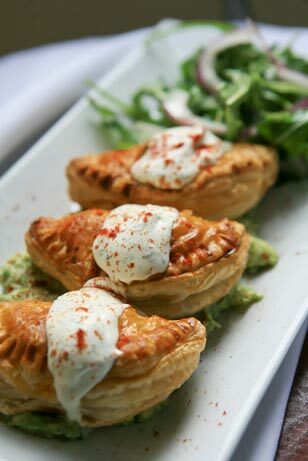 Delicious puff pastry empanadas at The Gables will delight for Valentine's Day! Photo courtesy of Betsy Barron Photography. The Gables at Chadds Ford is one of the region’s most romantic dining backdrops. The Gables is situated on land that was originally part of a 138 acre land grant from William Penn to Brinton King. Around 1745, a pre-Revolutionary style house was built on the property. This was one of the first homes to be built in Pennsbury Township. Two of the four original chimneys from the pre-Revolutionary style home are still visible. In March of 2002, the house was placed on the National Historic Register. In addition to their regular dinner menu, The Gables will be offering specials on Valentine’s Day that include pan roasted halibut, braised beef short ribs and a dark chocolate mousse. Homemade cheesecake topped with fresh berries and strawberry coulis at The Farmhouse Bistro. Photo courtesy of Courtney Apple Photography. For an experience you can truly fall in love with, feed your passions this Valentine’s Day at Paramour. Photo courtesy of Tom Crane. From Friday, February 10th until Tuesday, February 14th , Paramour will serve a variety of special dishes and offer a romantic night at the hotel, including credit towards dinner, luxurious amenities and a guaranteed reservation at the restaurant on one of the busiest weekends of the year. “Whether they’re looking for a romantic evening or to relish in an exquisite meal, we’ve got something for everyone this season,” says Executive Chef Michael Giampa. Guests can enjoy ‘The Perfect Valentine’s Package’ that includes a King Superior Room for two with late check-out, continental breakfast for two, a dozen roses, a split of Gruet Brut sparkling wine, a box of Godiva chocolates, a guaranteed dinner reservation for two at Paramour and a $50 Paramour gift card. This package, including all hotel taxes, is $329 per couple. For those who’d like to dine in style, Paramour is also offering special additions to their menu. Offerings will include: Chilled Atlantic Seafood Plate, Grilled Maine Lobster, Surf & Turf and a Contemporary Dessert Sampler for two. On Saturday, February 4th, from 1pm to 3pm, The Radnor will host its annual Children’s Valentine’s Tea. Guests will be welcomed and escorted by the Valentine Fairy where magic, fun, and entertainment are plentiful. They will enjoy a selection of scones, sandwiches, miniature pastries and cookies, as well as an assortment of tea, sparkling apple cider, hot chocolate, and chocolate milk. The cost of the tea is $59.95 for 1 adult & 1 child, excluding tax and gratuity. It is ideal for kids’ ages 3 to 8 years. Advanced ticket purchase and reservations required, please call: 610.341.3146. For more information on Children’s Saturday Afternoon Tea, please visit radnorhotel.com. From Friday, February 10th until Tuesday, February 14th, guests of The Radnor can enjoy an exceptional overnight package that includes deluxe overnight accommodations, a bottle of chilled champagne, chocolate truffles, a long stem red rose, a four-course prix fixe dinner for two and deluxe breakfast for two. This all-inclusive package is only $289 per couple. 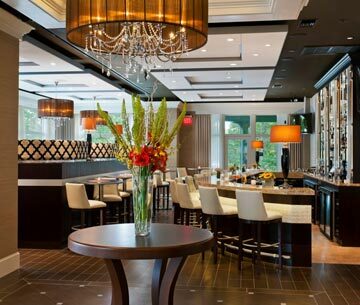 Couples with no time for an overnight getaway can come to Glenmorgan Bar & Grill from Friday, February 10th until Tuesday, February 14th, 2012 to savor a four-course prix fixe dinner for two in celebration of Valentine’s Day. This sumptuous meal is only $99 per couple and includes dishes such as Scallop & Smoked Bacon Gratin, Dijon Herb Rack of Lamb, Grouper & Raspberry Beurre Rouge and decadent Brownie Sundae to share. To view the full menu, click here. 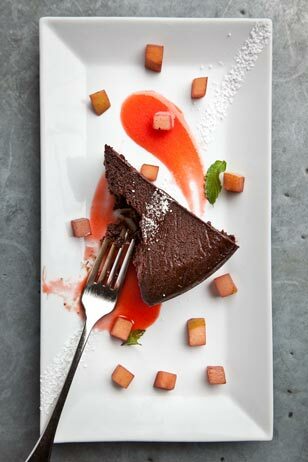 Sullivan’s has an outstanding value for Valentine’s Day: 3 courses, plus a choice of a delicious side, per couple for only $89! Add a half Australian lobster tail for an additional $20. Oscar Style-jumbo lump crab, asparagus & béarnaise for an additional $10. Lobster macaroni and cheese for an additional $8. Redhound Grille is offering a Valentine’s Day three course $40 menu on Friday, February 10th, Saturday, February 11th and Tuesday, February 14th. On the 14th, the restaurant will have romantic acoustic music from Chris and Kallina Holt from 7pm to 9pm. 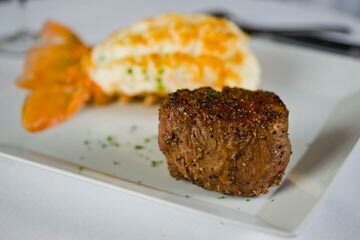 Valentine’s Day menu highlights include appetizers: clam casino, strawberry salad, lobster bisque, seafood flatbread; entrees: filet mignon, paella, Scottish salmon wellington, potato gnocchi and blackened rib eye. 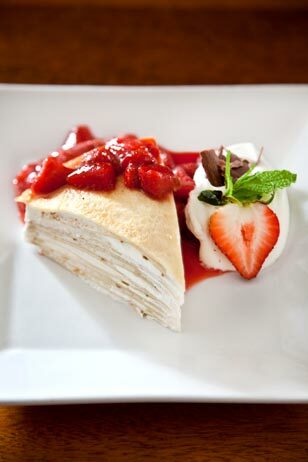 They will also have a full selection of their popular desserts. « Giveaway: Win Two Tickets to the 2012 Red Ball!